As part of this year’s Dementia Awareness Week, residents at Clifden House Dementia Care Centre, Seaford, have collaborated with St Peter’s Church to open a week-long art exhibition at the Belgrave Road church on Sunday 20, May. The art exhibition is part of the residents’ efforts to raise awareness of dementia during this year’s Dementia Awareness Week. 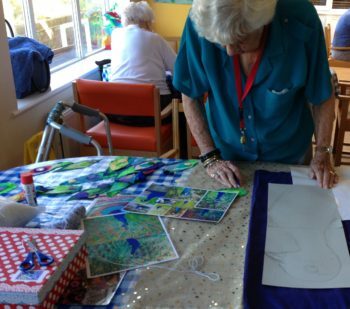 With the help of Clifden House’s activities coordinator, Deena, and Art Techniques director, Carol, residents of the dementia care centre have used their creative skills to create a range of visually stimulating art. Nial Joyce, of Clifden House Dementia Care Centre said: “This has been a joyful project to run and has had a life-affirming effect on the residents. Visual images are stimulating for dementia sufferers, so providing the opportunity to create these works of art has had a very therapeutic effect on everyone involved. The exhibition launches Sunday 20, May during the 9:30 service of Holy Communion at St Peter’s Church on Belgrave Road in Seaford. The church exhibition will be open all week from 9:00 – 17:00. There will also be a prayer tree where the name of someone with dementia, or who has passed away from the disease can be added. Please share your photos and thoughts on the exhibition on Twitter or Facebook with the hashtags #DAW2018 #ClifdenHouse so we can find them! The collaboration between St Peter’s Church and Clifden House Dementia Care Centre is part of a comprehensive activity calendar at the home to create an active and vibrant environment where people stay connected to and involved in their local community. Clifden House is one of the leading dementia care homes in the South East. It has an overall ‘good’ rating from the CQC.